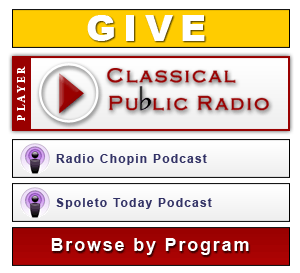 ClassicalPublicRadio.org is a service of WDAV 89.9 Classical Public Radio and Davidson College. WDAV is one of America's leading producers of original classical music programming. In addition to producing 140 hours per week for its own broadcast use on its HD-1, HD-2, and wdav.org channels, the station produces nationally-distributed programs, including World of Opera, Radio Chopin, and, in partnership with South Carolina Public Radio, Carolina Live and Spoleto Chamber Music.